SOUTH HOLLAND, IL – South Suburban College hosted its 5th Annual Open House on Thursday, August 2nd from 4:30-7:00 p.m. with something for everyone. There was fun, excitement and a large dose of enthusiasm provided by college staff. The Open House, geared toward providing College information and pathways to successful careers, saw nearly 300 persons come through its doors seeking just that. Many participated in College tours and raffles for Visa Gift Cards, and other giveaways. WGCI and Tone Kapone were also on campus and rounded out the fun. Program representatives from STEM (Science, Technology, Engineering & Math), Manufacturing, Building and Construction, Paralegal Studies, Court Reporting, Allied Health, SSC Maker Lab, Graphic Arts, Nursing, Applied Engineering, Electronics Engineering, Computer Aided Design (CAD), Job Training, the new Latino Center and many more were on hand to answer questions and guide potential students with program facts and requirements. 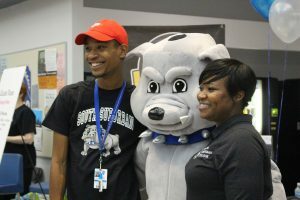 SSC’s mascot Bruno the Bulldog was on hand as part of the fun at the South Suburban College Open House.